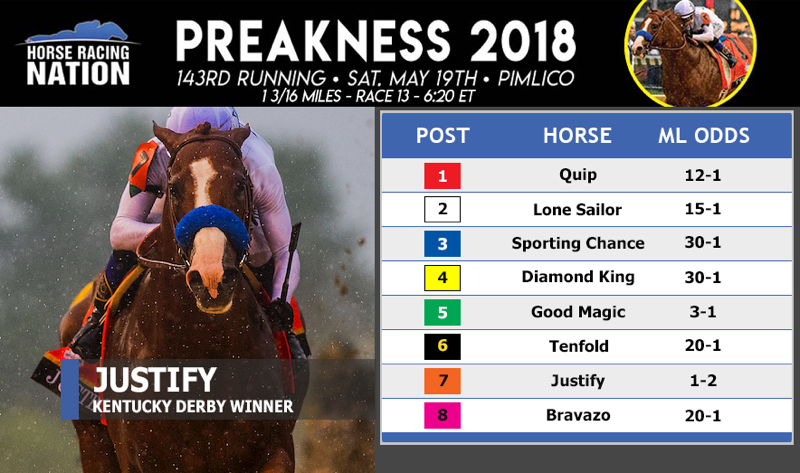 It appears to be Kentucky Derby winner Justify, runner-up Good Magic and then the rest in the 2018 Preakness Stakes, the middle jewel of the Triple Crown series running Saturday at Pimlico Race Course. Hours before the race, Justify moved from the 2-5 price at which he closed Friday to match his 1-2 morning line odds. Could he go even lower? Rain is still falling in Baltimore, and he’s already proven over a sloppy track. Post time for the Preakness is 6:48 p.m. ET Saturday with NBC set to broadcast. We’ll update the odds hourly leading up to the race.